This is a screenshot of the chromatin DNA scene I am building up to set the scene for some DNA damage to take place. There is almost 2m of DNA packed into the nucleus of our cells. 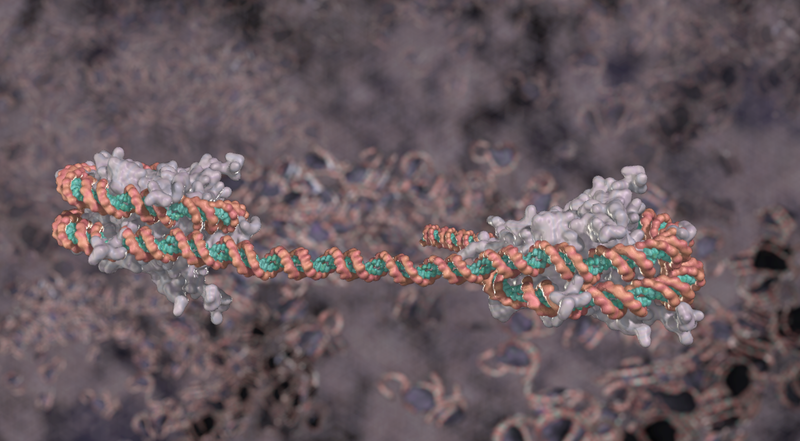 To make this fit, DNA is packaged tightly in an organised fashion and is wrapped around nucleosomes (grey in this image) which are made up of eight histone proteins that have long, flexible tails (approx 30 amino acids in length). Histone tails can be modified and can also move and interact with surrounding molecules. The nucleosome structure is scientifically resolved and available in the protein data bank (pdb.org) which is where these models come from. However, because the long histone tails are so flexible, they are really hard to crystallise so the model for these is incomplete or not available.